Blue Japanese oak (Quercus glauca Thunb.) 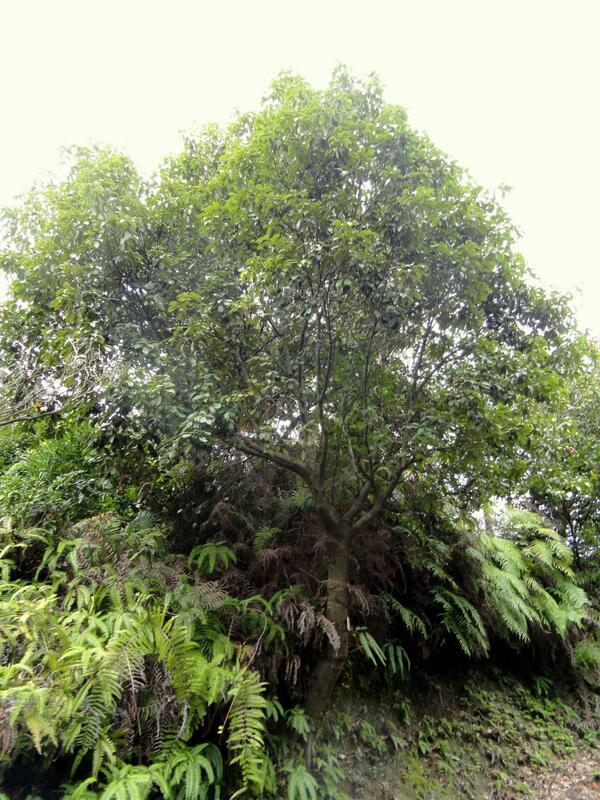 is a medium-sized tree native of Asia used as fodder in Nepal and India. Blue Japanese oak is an evergreen tree, 10 to 20 m high in its native Asia and slightly smaller (8-10 m) under Mediterranean conditions. It has a straight cylindrical bole, up to 45 cm in diameter, covered with greyish bark (Hélardot, 2015; Ducatillion, 2010; Orwa et al., 2009). The tree may be multi-stemmed (NC State University, 2015). The crown is oval to rounded. Its branches are widely spread, and young twigs are glabrescent, thick, stiff, dark olive green with pale lenticels. Blue Japanese oak is taprooted (Hélardot, 2015; Ducatillion, 2010; Orwa et al., 2009). The leaf blades are evergreen, alternate, simple, oblong to obovate-oblong, acuminate at the apex and broadly cuneate at the base, serrated, 7-13 cm long and 4-5 cm broad. The upper face of the leaf is glabrous and glossy green and the lower face is silky and hairy, blue green in colour (Hélardot, 2015; Ducatillion, 2010; Orwa et al., 2009; Forestry Nepal, 2005). New foliage is a rich green or bronze to purple green (Forestry Nepal, 2005). Flowers are dioecious catkins. Male flowers are silky, hairy, loose drooping catkins: they bear 4 stamens. Female catkins are shorter and bear 2-4 flowers. 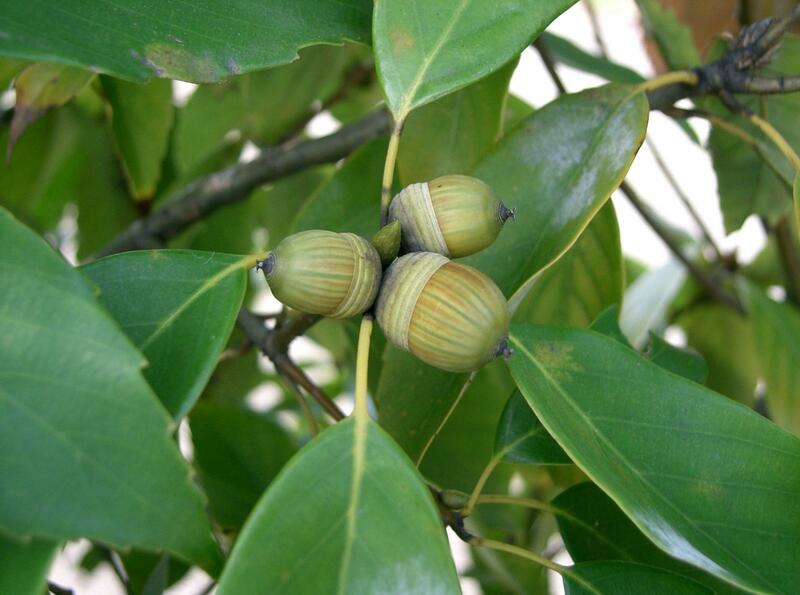 The fruits are 1.5-2 cm long x 0.9-1.4 cm broad, ovoid acorns, generally borne in clusters (3 fruits/cluster). A third or half of the fruit is enclosed in a ringed, scally silky cup (Hélardot, 2015; Forestry Nepal, 2005). Blue Japanese oak acorns are edible, but their high tannin content makes it necessary to leach them prior to grinding. This can be done by thorough washing of the acorns or by burying them in the ground to overwinter. However, leaching the flour may be more efficient (Orwa et al., 2009). The acorns can be dried, ground into powder and used as flour when mixed with cereals to make breads. The powder can also be used as a thickening agent in stews. Roasted seeds can be used as a coffee substitute. Leaves can be cooked and eaten as a vegetable in times of scarcity (Orwa et al., 2009). The branches and twigs are good material for culturing mushrooms (for example, Pleurotus eryngii) (Ducatillion, 2010). Blue Japanese oak is subject to galls that are sources of tannin and dye. The wood is a good quality timber, finely textured, hard and durable, and is also valuable fuelwood (Orwa et al., 2009). 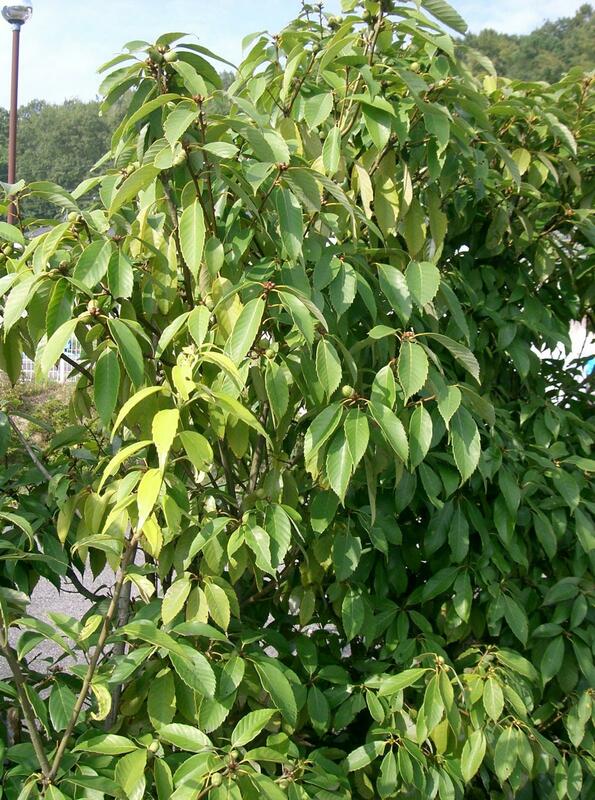 The tree is regarded as an ornamental plant for gardens, parks and streets because it has a good shape and provides desirable shade (Orwa et al., 2009). The leaves and stems are valuable fodder, relished by deer in the USA. The leaves are used to feed oak tasar silkworms in the hilly regions of China and India (Arindam Basu, 2015; Ducatillion, 2010). Blue Japanese oak is found in evergreen broad-leaved forests in northern subtropical and warmer temperate zones of Asia. In Nepal, it is typically found in Chilaune (Schima wallichii) - Katush (Castanopsis indica) degraded forests, and in association with banj oak (Quercus leucotrichophora) and woolly-leaved oak (Quercus lanata) (Orwa et al., 2009; Forestry Nepal, 2005). Blue Japanese oak is a native of China, Japan, Nepal, Pakistan and Vietnam and is now found in Europe, the USA and the Mediterranean Basin (Ducatillion, 2010; Orwa et al., 2009). In Nepal, it often develops well on moist, northern faces and sides of ravines (Forestry Nepal, 2005). Blue Japanese oak is found at altitudes from 300 m to 3100 m where annual rainfall ranges from 1000 to 2900 mm, and where average annual temperature is between 6°C and 19°C. It can grow on many types of soil but does better on light to medium, acid to neutral, well-drained, moist soils. It can withstand dry spells provided it is established under moist conditions. It is moderately hardy, some trees being killed by very low temperatures (-12°C to -16°C) in French Mediterranean areas (Ducatillion, 2010). Blue Japanese oak does well on slightly acidic or slightly saline loams and neutral limestone soils. Pure stands often occur on moist clays underlain with sandstone and shale (Orwa et al., 2009). It also grows well on deep clay loams but should not be planted on dry sites (Forestry Nepal, 2005). Blue Japanese oak can be sown directly or raised in nursery beds. However, since it quickly develops a deep taproot, direct sowing is advisable where possible. If the seedlings are sown in nursery beds they should not be left for more than 2 growing seasons so that the taproot does not develop too much. Bare-root planting gives very poor results (PFAF, 2014; Orwa et al., 2009). The seedlings are sensitive to frost and must be protected during winter, but older trees are more frost-resistant (Orwa et al., 2009). Blue Japanese oak is a slow-growing species: two-year-old seedlings reach a height of 50 cm (Forestry Nepal, 2005). The tree can be coppiced (Orwa et al., 2009). Well-managed plantations reach 8 m in height with a 7.5 cm diameter after 14 years (Orwa et al., 2009). In Nepal, blue Japanese oak is used as a fodder but it has a great variety of uses. Average annual fodder yield is 80-100 kg of fresh matter per tree (Forestry Nepal, 2005). The nutritional value of the leaves is rather poor, with a low protein content (about 10% of DM) and large amounts of fibre and tannins. Like other oak species, blue Japanese oak may have detrimental effects on animal health. In oak poisoning, clinical signs occur 3-7 days after consumption of large quantities of young oak leaves in the spring, or green acorns in the fall. Outbreaks have occurred when hungry animals have gained access to fallen trees associated with a recent storm. Mortality as high as 70% has resulted. In pregnant cows, the consumption of acorns during the second trimester of pregnancy resulted in malformed calves and abortions. The toxicity could be due to pyrogallol, gallotannins, polyhydroxyphenolic compounds, or their metabolites produced by microbial hydrolysis in the rumen, which bind and precipitate proteins, and result in general and renal dysfunction (Blakley, 2013). Blue Japanese oak seeds contain high levels of tannins that may be toxic to animals and humans. It is recommended to wash them thoroughly before using them (Orwa et al., 2009). When fed at high levels, oak (Quercus incana) leaves produce toxic effects (Lohan et al., 1983; Makkar et al., 1991). Their tannin content increases with maturity but the protein precipitation capacity of these tannins is among the lowest in the genus Quercus (Makkar et al., 1991). Incorporation of Quercus incana leaves into mixed rations above 14% (on dry weight basis) has been shown to have adverse effects (Lohan et al., 1983). Feeding at higher levels or as the sole feed resulted in oak poisoning (Makkar et al., 1991). Although growing conditions are known to influence tannin levels, it was inferred that the mature leaves of blue Japanese oak would produce adverse effects even at lower levels of feeding, as the tannin levels in leaves of this species are higher than those of Quercus incana (Lohan et al., 1983). Feeding mature leaves of blue Japanese oak might be more deleterious than feeding younger leaves (Makkar et al., 1991). Mixed beef cattle experimentally fed blue Japanese oak leaves showed clear clinical and histological signs of poisoning, resulting in the death of 2 animals out of 4 (Hwang et al., 1991a; Hwang et al., 1991b). Though blue Japanese oak leaves are of limited nutritional value and toxic to livestock (see Potential constraints above), they are harvested in Nepal for direct feeding or for storage and subsequent use as fodder in times of scarcity (Lohan et al., 1983; Bajracharya et al., 1985 cited by Paterson, 1993). In Manipur (North-Eastern India), cattle and goats consume the acorns, and the leaves are lopped by farmers to feed cattle at the end of the lean season, from January to May (Koireng et al., 2015). 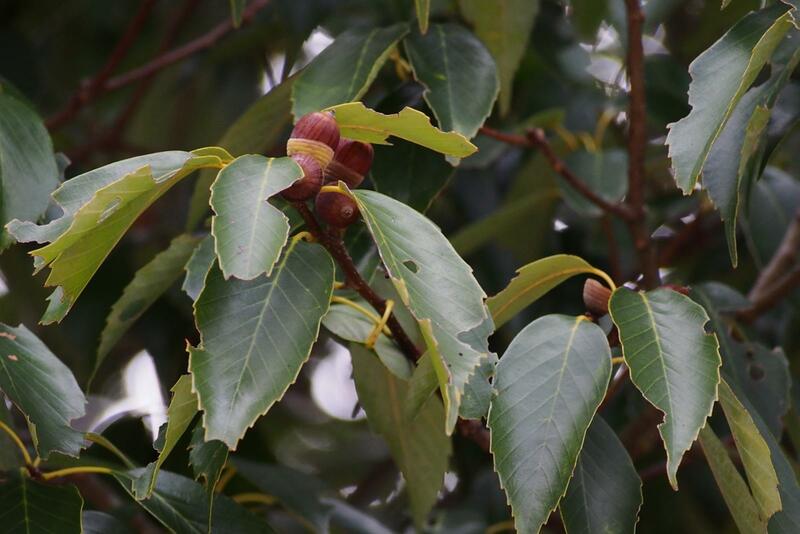 In a survey of smallholder farmers in the Garhwal Himalaya (Northern Himalaya), Quercus glauca was mentioned as a fodder species in oak-dominated zones, but with much lower marks than Quercus floribunda for nutritive value and milk production capacity (Dhani Arya et al., 2011). Blue Japanese oak acorns have been described as potentially useful as poultry feed due to their nutrient content (Marwat et al., 1978). However, their high tannin content would require thorough processing before being used as feed. Unlike other oak species, no information has been found in the international literature on the utilization of Quercus glauca leaves or acorns in rabbit feeding (January 2016). Arindam Basu, 2015. Advances in Silk Science and Technology. Woodhead Publishing, 298 pp. Blakley, B. R., 2013. Overview of Quercus poisoning. In: Aiello, S. E. (Ed. ), Merck Veterinary Manual.